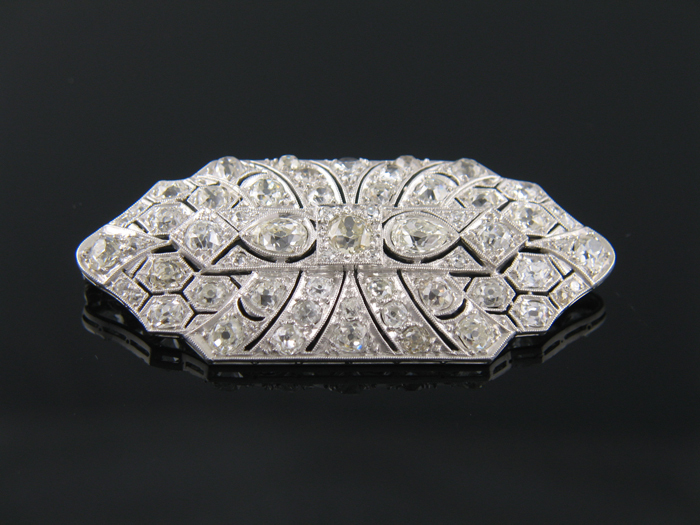 From ancient times to a modern resurgence, brooch styles and settings are vast and unique. 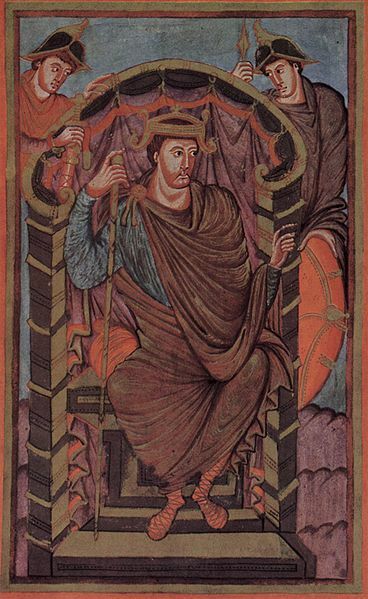 King Lothair I is shown in a cloak fastened on one shoulder with a brooch, c. 850 A.D.
Brooches have had quite a variety of styles throughout history, although all are marked by a mechanism for fastening. Brooches encompass a category that covers the terms brooch, pin and fibula. A Fibula is the only term that is really fixed in time, representing a fastening used in ancient or classical times. 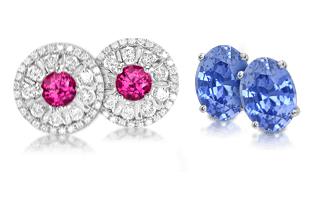 To this day, antique brooches are often highly desired by collectors and lovers of jewelry, and cultural influences continue to bring the brooch back into style. 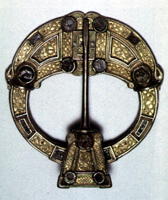 Celtic penannular brooch c. 8th century C.E. Also called the ring brooch, this is one of the oldest style of brooches after the fibula, and dates back to the fifth century in Europe. The design is very simple featuring a ring with a pin stretching down the back. Similarly, the penannular brooch is the exact same design with the slight difference of the ring being open. 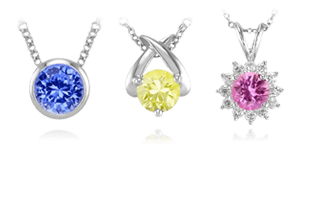 Both can be covered in precious stones, etched with intricate images, or as simple as being polished metal. A platinum, diamond, and jade jabot pin, c. 1930. A descendant of the pin, or the stick pin, the jabot pin is a type of brooch that is long and quite vertical in its orientation. It features ornamentation at both ends of a single pin, with a fastening mechanism on one end, so that as the pin goes through the article of clothing, it disappears leaving the two ends as the decoration. This pin originally gets its name from the piece of clothing, the jabot, that was a ruffle attached to the front of clothing by men and women in the 17th century. 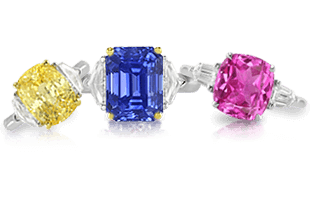 As a piece of jewelry, it was highly popular during the 20th century, particularly the Art Deco period when it became quite prominent as ornamentation on hats and handbags for women. The luxury jewelry design firm of Cartier also loved this look, becoming famed for its jeweled jabot pins produced in the 1920s and 1930s. 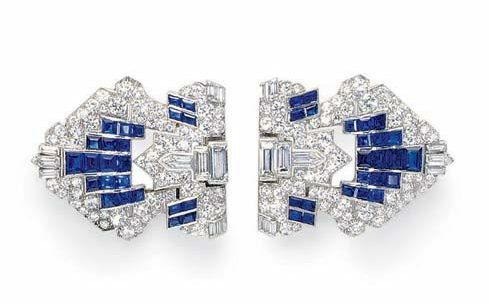 A pair of Art Deco diamond and blue sapphire dress clips. Also gaining prominence and popularity during the 1920s and 1930s was the dress clip. Worn similarly to a brooch, it fastened via a clip mechanism that usually contained prongs to help it stay securely on the clothing. Larger versions of these clips were sold on their own, and smaller versions were often sold as a set. 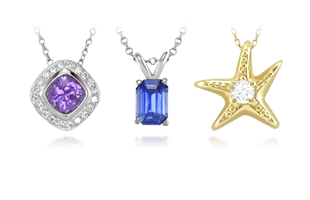 The pair could be worn at each shoulder or at the corners of square necklines. 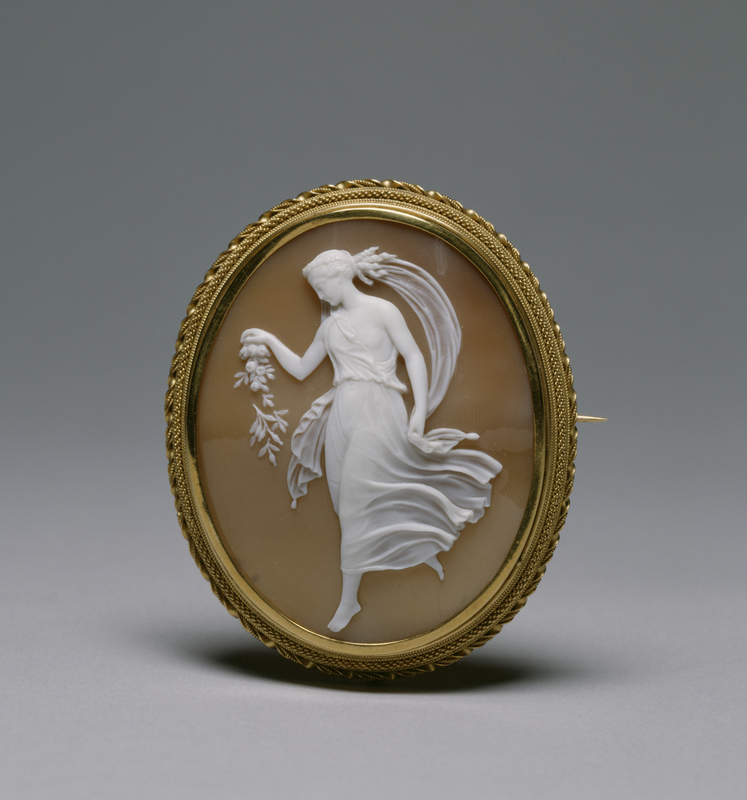 An Italian designed cameo brooch featuring the likeness of Spring. 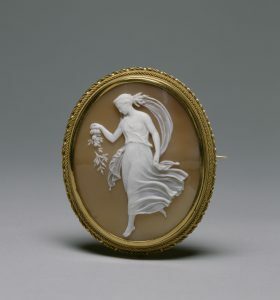 Cameos themselves date back to ancient times, but cameo brooches were popularized by Queen Victoria in the 19th century as she was particularly fond of them and would often bestow them as gifts to members of the court or her staff. Cameos are hard stone or shell carved with depictions of legends, mythologies, or famous heads of state, which have then been placed on a metal base with various adornments surrounding it. 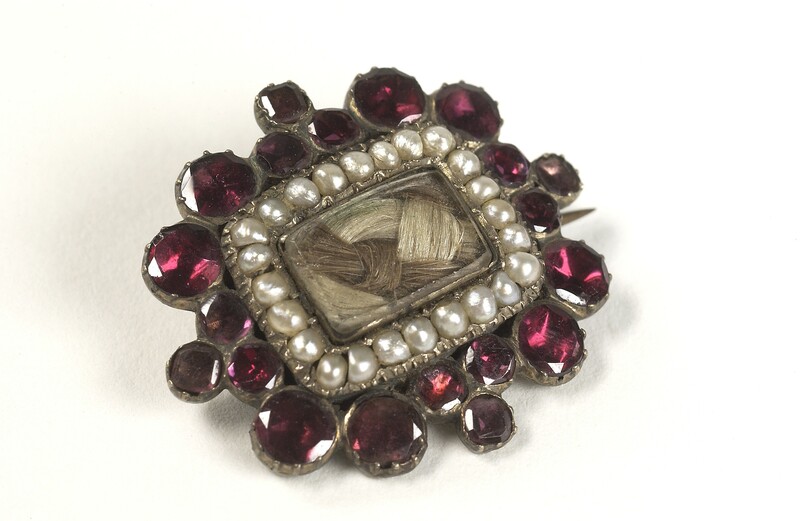 Mourning brooch containing the hair of a deceased relative, surrounded by pearls and garnets. As with all forms of mourning jewelry, a mourning brooch was commissioned in honor of a loved one whom had passed. During the height of their popularity in the 18th and 19th centuries, mourning brooches took on singular and unique design features. Many may be engraved with the loved one’s name, birthdate, and date of death, they may feature a sepia-toned death motif with doves and gravestones, or even be set with pearls symbolizing tears. The mourning brooch was also heavily popularized by Queen Victoria whom mourned for twenty years the passing of her love, Prince Albert. This event brought into style the hair mourning brooch, which featured a strand or strands of the loved ones hair woven into a design and placed behind a plate of glass or enamel in the brooch. An antique silver with gold plate love brooch. 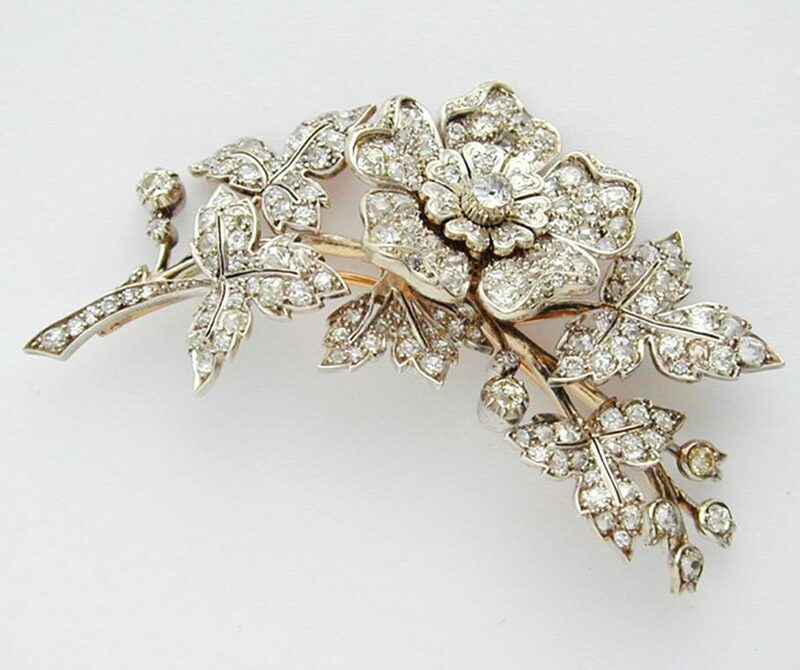 Also appearing in the Victorian period , the love brooch brought the wearing and styling of brooches to the masses. These brooches were carved from sheets of hammered silver and designed to be gifted as tokens of affection. 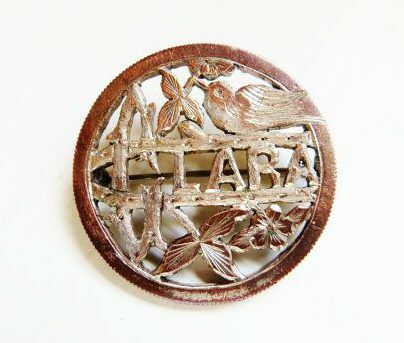 Due to these brooches being lightweight and made of silver with only an overlay of gold (in some instances), these were accessible to just about all social classes as keepsakes that would feature lovebirds, hearts, and good tidings. A gold and diamond floral en tremblant brooch, c. 1930. Using the French term en tremblant, meaning to tremble, this style of brooch featured a mechanism where part of the brooch would move when worn. Fashionable in the 18th and 19th centuries, these were often designed as a floral spray and set with rose-cut or old-mine diamonds to really capture the light and feature the trembling effect from the movement. An aigrette brooch set with flat-cut garnets. At the height of fashion in the 17th to 18th centuries and then again in the 19th to 20th centuries, the aigrette brooch featured a distinct feather shape and either birds or the allusion to birds. 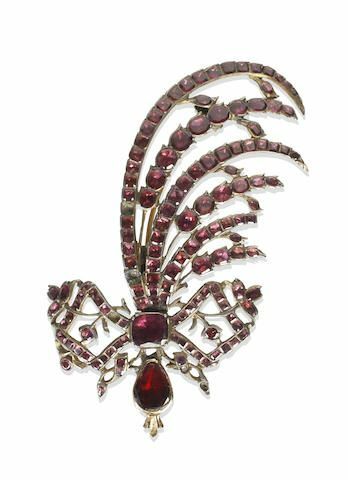 Often set with flat-cut gemstones, the most popular of which was garnet or diamond, the aigrette was very detailed and was often also worn in the hair. All of these styles have occurred throughout history, and next we explore some Famous Brooches | A Selection from History.